NYSBA, along with the 50 State Broadcast Associations, sent a letter to Sen. 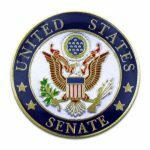 Majority Leader Mitch McConnell (R KY) and Minority Leader Senator Charles Schumer (D NY), asking them to support the Music Modernization Act (S.2823). The bill already passed the Senate Judiciary Committee. A key component of the Act is to establish Congressional control for the DOJ’s review of the ASCAP and BMI antitrust consent decrees. Earlier, the DOJ signaled that the consent decrees may no longer be necessary. Eliminating the consent decrees would be harmful to radio stations. Recently, the DOJ has stepped back from those comments and recognizes Congresses’ role. The bill would formalize Congressional oversight over the BMI and ASCAP consent decrees. To see a copy of the letter click HERE.